Everything was great. The staff was nice and the property was clean. Food was so so... you had to eat before 9 or you’d be hungry and the 24 hour food bar was bad. Steakhouse was great. Beautiful resort!! So much to do and so many areas for all types of people’s likings. The servers and bartenders were friendly. Management was not friendly and they lied . Yrhere was no hot water and they kept saying they would send someone to my room to fix it... never happened. I checked with other guests and they had same issue. The buffets in the main dining are had so many flies on the foods. The inside restaurants were so cold inside you couldn’t comfortably enjoy your meal. Will never go back here!! This place is wonderful for meeting new people from all around the world. This is definitely a party/fun atmosphere. Grounds are gorgeous and well maintained. Rooms old dank and dated. Food was sll buffet and just ok. Didn’t feel they put a lot of effort into cleanliness anywhere. Not even after tipping the maids. Beautiful property had a great time. Food wasn’t amazing, but tons of options. Pink party was a blast. Property: grounds is immaculate, staff is always on premise cleaning or trimming the shrub. Beach chairs: season travelers know the headache of walking up early in the morning to reserve beach/ pool chairs. This resort is different, there's like 4-5 polls throughout and ample prime tanning spots. No need to reserve anything, whenever you are ready just head down to the beach. Staff: absolutely wonderful. They take pride in working for RIU, they are boastful on the amount of yrs of service. I don't know about you, but happy employees make a big difference. Juana (main restaurant) we love you. She should be responsible for training staff, our classes was never empty. As busy as she was, she came by like clock work and refilled our drinks. Every table she was interacting with guest. Listen her section was always crowded, we really enjoy her service. Amenities: not much to do to be honest. No miniature golf etc. 2 pool tables and one air table hockey. Beach: treacherous to say the least. The waves are ridiculous, this beach is better equipped for wind surfers, para sailing etc. I almost drowned. Lost my glasses and my bf lost his. Didn't see any life guards. If you are all about calm island beaches this is not the place for you. Activities: Day and night had fun activities. Tons of themed pool parties ex pink party, foam party, white party. Lots of main shows ex magic show, Latin night, Michael Jackson etc. There's also the club paccha, more like a lounge. I enjoyed my stay and the staff was great! I highly recommend Riu Republica! Very friendly staffs & clean facilities. Great food selections. Loved the Latin theme pool. Wish there wasn't as many smokers - or perhaps a smoke free pool. Beach is beautiful. No seaweed, soft white sand. Food is awful. Only one sit down restaurant, the steak house. Menus is very limited. Steak was what I would expect if McDonalds started serving steak. Everything else is a buffet. The pools were great. Some had volleyball, some had bars, and there was a couple big pools with room to move around. Then they also had the slides to have a little fun on without the big lines of water parks. Very clean, every restaurant had great food, a lot of fun! Has a great beach and large number of pools, plenty of chairs always avail. No drink service on the beach. Hard Rock Golf Club at Cana Bay is a short stroll from Riu Republica - Adults only - All Inclusive, and other popular attractions like Arena Gorda Beach are within a few miles (5 km). This 1382-room, 4-star property has 8 outdoor pools along with a free water park and 9 restaurants. Free hot/cold buffet breakfast is served each morning from 7 AM to 11 AM. There are multiple options for onsite dining with 9 restaurants, including La Altagracia, which specializes in regional cuisine. A flat-screen TV comes with satellite channels, and guests can stay connected with free WiFi. The bathroom offers hair dryers, free toiletries, and slippers. Other standard amenities include a furnished balcony or patio, a minibar, and a coffee maker. 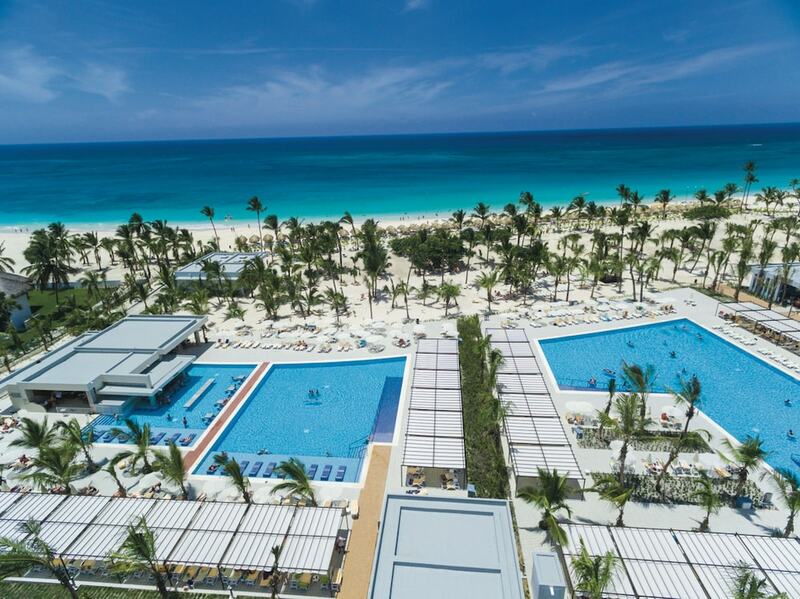 Guests of Riu Republica - Adults only - All Inclusive have access to 8 outdoor pools, a free water park, and a nightclub. A stay here includes free parking. Front-desk staff can answer questions 24/7, and assist with concierge services, dry cleaning/laundry, and luggage storage. Other amenities at this all-inclusive property include a health club, a spa tub, and a steam room. Free hot/cold buffet breakfast is served daily from 7 AM to 11 AM. La Altagracia - Restaurant specializing in regional cuisine. Open daily for breakfast, lunch, and dinner. Tarantella - Buffet restaurant specializing in Italian cuisine. Open daily for dinner. Kaori - Buffet restaurant specializing in Asian cuisine. Open daily for dinner. Quisqueya - Steakhouse open daily for dinner. Recreation features at Riu Republica - Adults only - All Inclusive include a health club and a waterpark with waterslides. The property has 8 outdoor swimming pools and a spa tub. A steam room and a fitness center are other recreation options. The preferred airport is Punta Cana (PUJ-Punta Cana Intl. ): 29-min drive, 18.1 mi/29.2 km.